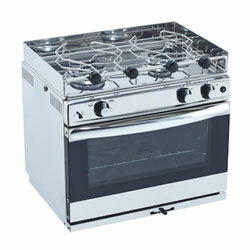 Stove tops surrounded on three sides by a raised flame guard that also helps to keep culinary masterpieces where they belong. ENO has worked in close collaboration with the French marine industry professionals for the last 25 years makes them a market leader in galley equipment. ENO marine products have been specially designed for pleasure boating so that all appliances are either stainless steel or anticorrosion treated, all are fitted with stabilizer and locking devices, all burners include a thermocouple safety device. ENO gives you the opportunity to combine yachting and cooking pleasure.